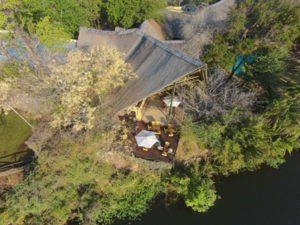 Situated in the town of Kasane, less than 100 kilometres west of Victoria Falls, and just 5 minutes drive from the Chobe National Park, Chobe Safari Lodge overlooks the perennial and beautiful Chobe River with its Caprivi floodplains. The Lodge boasts a variety of accommodation on offer. There are luxury en-suite River Rooms, the new and highly recommended Safari Rooms, and the thatched, more traditional, rondavels. All accommodation has en-suite bathrooms, while the Safari and River rooms also offering air-conditioning. The rondavels are independently positioned, and are equipped with ceiling fans. There is also the well-known Chobe Safari Lodge campsite, which has a first-rate ablution area and facilities, adjacent to the Lodge. The Lodge offers guests and visitors, a choice of two Restaurants: The Terrace Restaurant offering a range of International and Local dishes and the Buffet offers an impressive choice of BBQ meats, salads and a range of other dishes. There is also a large and varied breakfast buffet is offered in the terrace restaurant, with a choice of a Continental or fully cooked English breakfasts. Lunch time snacks can be eaten at the Cocktail Bar, or can be enjoyed whilst you are relaxing around the pool. The Sedudu Sunset Bar overlooks the Falcon of the same name, and is a perfect venue from which to enjoy the magnificent African sunset, whilst enjoying the sights and sounds of the River. At night, guests can also dine under the stars by the light of a hurricane lamp, or on the terrace restaurant overlooking the River. Other than the swimming pool, Chobe Safari Lodge also offers a volley ball court, glass back squash court, a health and beauty salon, and internet Café. The Chobe/ Caprivi floodplain area is renowned for its concentration of buffalo and elephant and the late afternoon in particular, can provide excellent game viewing. Chobe Safari Lodge offers a number of activities to guests, which include 4×4 Game Drives, boat cruises along the Chobe River, nature walks that take in the Zambian side of the River, sun downer cruises, seasonal fishing and trips to Victoria Falls. The National Park is arguably the best place in the world to see the majestic African elephant for it is home to the world’s largest population. Game drives into the Chobe National Park are available three times a day. 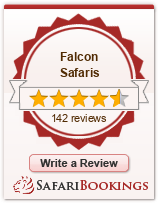 Alternatively, guests can choose a full day’s game drive, including picnic lunch. Cruises, led by expert guides are available throughout the day to suit individual needs. Cruises into the National Park are a somewhat different way of viewing the game. At dry season (April to September) in particular, the wildlife congregate in their thousands at the water’s edge to quench their thirst. 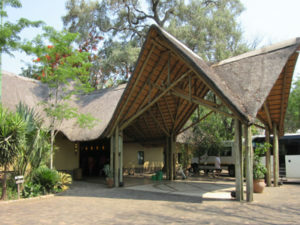 The Chobe Safari Lodge is the best ‘value for money’ Lodge in the Chobe area. Combine your stay at the Chobe Safari lodge with a stay in Botswana’s premiere destination The Okavango Delta. We offer a special FIVE night package – 3 nights at The Chobe Safari Lodge and 2 Nights at Pom Pom Camp in the Okavango From US$1635 per personbased on two persons travelling in low season – including light aircraft flights out of Kasane and back to Maun.